Physical wellness is defined not only by the outward health of the body but also the inner body such as organ function, mental health and emotional wellness. It is important to understand how to find a healthy balance with your exercise routines and know when what you are doing is enough. Pushing too hard or going too far can have the opposite effect of what you are hoping for. Other overall wellness factors such as blood pressure, blood sugar, organ function, gut health, disease prevention, heart health, weight control and sleep are as important, if not more so than the outward appearance of fitness. A person can, in theory, be physically strong or be able to perform at a high physical level yet still not be physically well. Examples that come to mind are bodybuilders using synthetic growth supplements that hurt the liver and reproductive organs or some endurance training that for various reasons requires overtraining which can lead to injury and other serious health complications. Knowing the difference between what is healthy and what is not with fitness training sounds easy enough however it can be tricky. Physical fitness has to do with range of motion, flexibility, strength, endurance, energy levels and heart/cardiovascular health. It is a more outward representation of health where as physical wellness is represented both externally and internally. Remember in a holistic approach to health that true optimal wellness resides in the balance and synergy of all wellness activities including mental, physical and spiritual so work IN just as much as you work OUT. Our holistic health guide has you begin by creating an appropriate exercise routine. We consider exercising not simply for physical fitness but to include much broader aspects of overall health and although a very integral part of our holistic approach strategy we keep the physical exercise in balance with the other aspects of overall wellness for most effectiveness. Power Yoga – If you are not sure what to do for exercise go do a hot power yoga class with a great instructor. You will improve not only flexibility but also strength, endurance, cardiovascular health through deep breathing, and bonus you get meditative and spiritual benefits as well! Balance Ball Core Workouts – Can typically be found at most gyms and routines can be found online for home workouts. Bouncing On A Mini Trampoline – Another great little workout you can do at home with routines found online. Rebounding as it is sometimes called promotes lymphatic drainage along with endurance and cardio training. Hiking – An activity with many synergistic benefits like yoga. Throw in some pushups and ab crunching while on the trail and you’ve got a total body workout plus connecting with nature, adventuring, and forest bathing! It is proven that too much physical activity can be harmful and actually dangerous. These are some of the darker aspects of physical training in the modern era. So what is good enough in physical wellness? You certainly don’t have to look like a greek god or supermodel to be healthy and physically fit. It is important not to train solely to look better because this can lead to disappointment, self-esteem issues and ultimately ceasing to workout. Ideally you want to train to be healthy and feel better. You will then be happy with the results and this will help you become the best version of yourself both outside and in. The pitfalls associated with an imbalance in physical training (both undertraining and overtraining) can have many adverse effects mentally, emotionally and even spiritually. There are more benefits that can be achieved through a well-balanced exercise program. Remember also that rest and recovery are considered just as important as the actual physical activity that you choose. Overtraining/Undertraining – Can cause a multitude of possible injuries and/or long term physical damage. Body Comparing – Lowered self esteem and feeling not good enough either by how your body looks or how well you perform a physical activity in comparison to others. Burnout/Lack Of Motivation – If physical training and exercise sounds like too much of a chore to accomplish then you might want to consider changing up your routine to avoid burnout or getting involved with a group for help with motivation and accountability. While we absolutely advocate physical exercise we are of the opinion that this can weigh in more heavily than necessary in our modern culture. Mental, emotional and spiritual health should be given the same importance as physical fitness. In the right amounts physical activity will actually help stimulate these other important areas but if over done then all aspects of wellness will be compromised. In fact an argument can be made that exercising the mind and the spirit in various ways has many physical benefits and can also enhance physical performance. Just going to the gym doing a few sets of curls and snapping a pic for your Instagram feed welcoming everybody to the ‘gun show’ isn’t going to bring you to the peak of all that a holistic approach to health can bring. The quest for physical wellness is the beginning point of a holistic health approach so be ready and willing to get up and move around! The physical aspect of the human being involves much more than just the portion we can see on the outside and holistic health isn’t all about standing in front of a mirror and posing – although better self esteem is a healthy side effect of better physical wellness. Physical wellness does involve muscle tone and strength conditioning but also involves other factors such as sleep/recovery, internal organs and systems as well as mental, emotional and spiritual aspects. 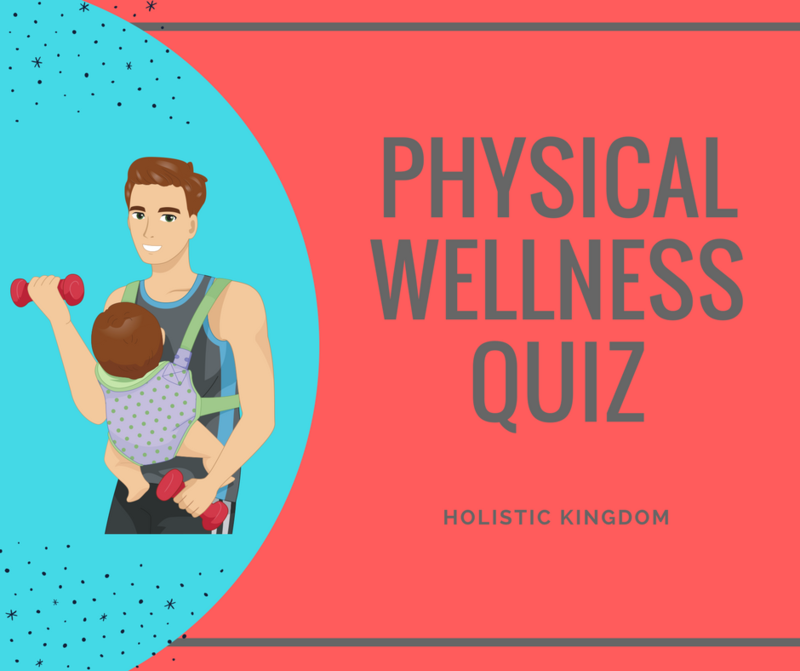 Measure Your Physical Wellness – Take Our Quiz!